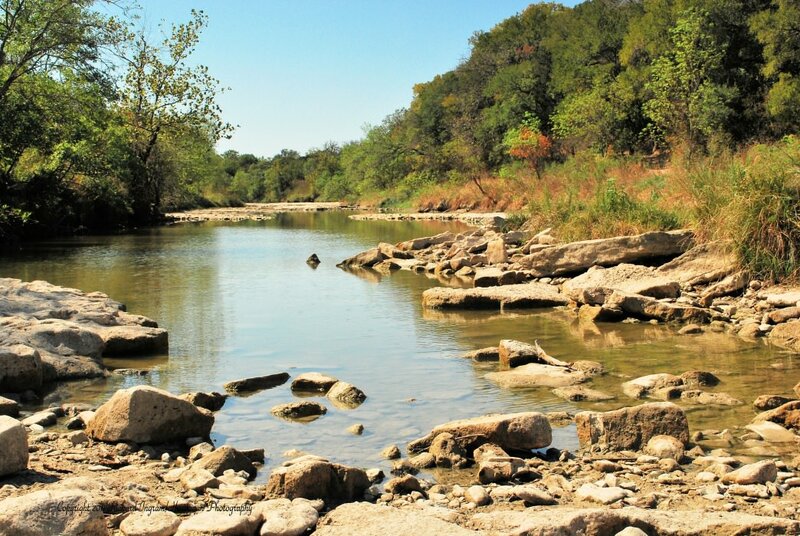 Varies; Dinosaur Valley State Park offers approximately 20 miles of interconnected mixed-use trails. Spring and fall are the best seasons to visit the park. $7 per person for day use (children under 12 free), or $70/year for a Texas State Parks Pass. Just a short hour drive from ‘Cowtown’ (Fort Worth), you’ll enter the Wild West. Not the wild west that you think of with gunslingers like Wyatt Earp or outlaw cowboys, but the wild west of ancient creatures roaming the land. 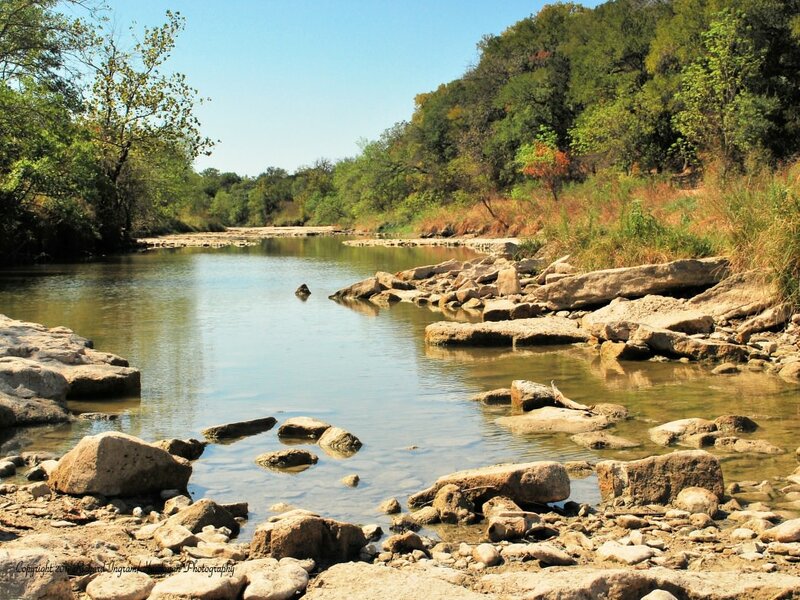 Millions of years ago, Dinosaur Valley State Park was at the edge of an ocean and was the feeding, fighting, and breeding grounds of many species of dinosaurs. Herbivores came to the water’s edge to eat, attracting carnivores who wanted to eat as well. With the ever present process of erosion, the limestone bottom of the Paluxy River has worn through to hundreds of ancient dinosaur tracks. 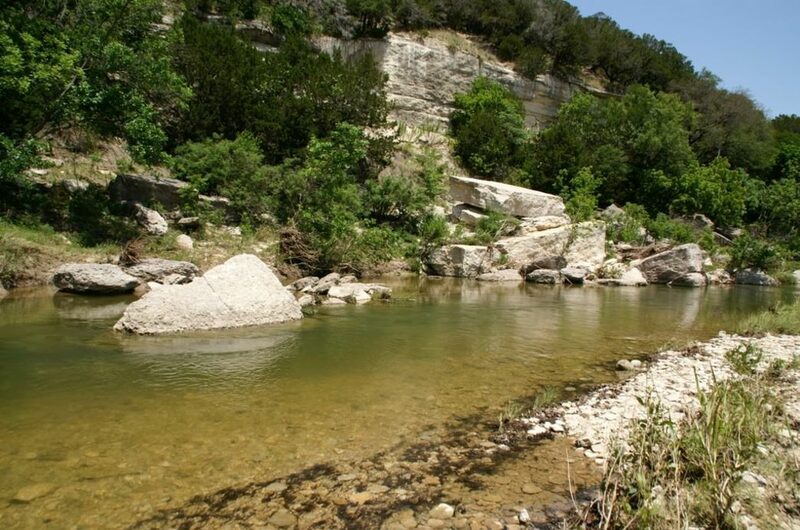 Running through Glenn Rose, TX, this river winds its way through dense forest creating a beautiful place to come hike and camp. The name of the park says it all – Dinosaurs! From the minute you enter the park, dinosaurs – er, their ancient foot prints, are what you’ll spend your time trying to see and learn about. Upon driving through the entrance gates various hiking trails become available immediately. The trails center around their access to the river and the different footprint sites throughout the park. Taking one of the first trails you come to, head west to the main footprint section. As you approach the trailhead you’ll trudge through prairie land until you hit the limestone boulders that signify the river. During the wet season, you’ll have to hunt for the sets of exposed tracks. In the warmer months, numerous track sites are exposed and provide for great photography. There are steep embankments on the opposite side of the river at this site and prevent you from moving further into the park. Take the eastern portion of the trails you’ll find access to primitive and backpackers camp sites. Here you’ll take the Cedar Brake Outer Loop and cross the river to the other side. This is the junction where you can choose your desired distance and views. Head northwest for a few miles, and you’ll reach the most beautiful vista in the park. Steep cliffs, large trees, and endangered birds characterize this route – and is topped off with a view over the river valley below at the designated overlook. Weekend warriors, day trippers, families & singles will all find enjoyment on the trails of this park. With the combination of present day nature and the educational aspect of its ancient nature there’s something for everyone to enjoy. There are water/electric camp sites at the park entrance for those who need it. For the more adventurous hikers looking for a weekend in the backcountry, a short trek across the river will provide access to 7 primitive camp sites. Taking I-35 south out of Fort Worth, you’ll get on Hwy 174 until you reach Cleburne. From here you veer onto Hwy 67 which will take you into Glenn Rose. Follow the signs in town and get to the park gates. Campsites with water and electricity will cost you $25.00/night, while the backcountry primitive spots run $15.00/night.